The following is a preview of the Impact Mapping Worksheet. For complete worksheet features, please download the worksheet file on the left hand side. This worksheet will help you describe your social, environmental and/or cultural mission in more detail to be able to better select indicators to monitor your community impact. The first sheet, 'Basic Mapping' asks you to more clearly describe the activities you do to make a difference, and what that difference will look like. 'Go Further' describes methods you can use to map out connections between your activities and what you want to accomplish with your mission. Templates are provided for three different mapping methods. The value you create through your mission can be multifaceted. The table below can help you fully identify all of the ways you create value as an organization, in ways you haven't thought about before. To use this worksheet, scan the areas below. If you specifically undertake activities in this area and/or see changes in the people and community you work with, describe them. 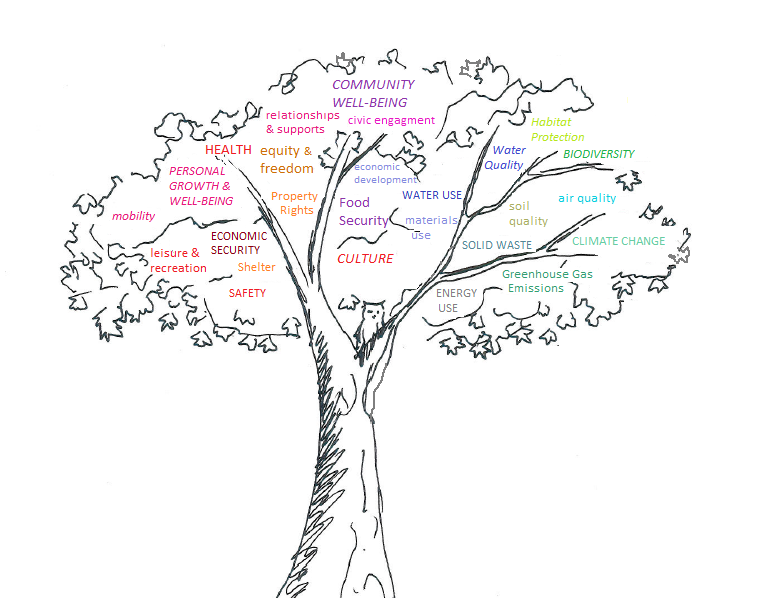 It may also be useful to visualize this using the Community Impact Tree image below. Find the words that you associate with your impact, and look at the other branches nearby to brainstorm other impacts. Fill out only what applies. You can take the work that you did in the basic mapping by going further to specify how your activities will make a difference, in other words - mapping the relationships between what you do and the long-term outcomes you want to see. This can be very useful for 1. planning, 2. for guiding what you monitor and 3. for communicating your impact. There are a number of different approaches, and excellent on-line l resources to help you with this. Choose a mapping method that suites you. Most are geared to programs, but are equally relevant to social enterprises. Describe the world in which your social and/or environmental objectives are realized. How is the community transformed? How are people different? How is the natural world and environment transformed? Developing a detailed theories of change allows you to think through the assumptions you are making that would lead from the activity that you can control to your ultimate desired outcome. In the blank cells bellow, fill in your theory about how change will occur based on your strategy.